Three weeks ago the Bishop of Providence, Rhode Island, the Most Reverend Thomas J. Tobin, offered a public response to the public insult that he and the whole American episcopate had received from Patrick Kennedy, Congressman from Rhode Island and son of the late Senator from Massachusetts, Edward (Ted) Kennedy. 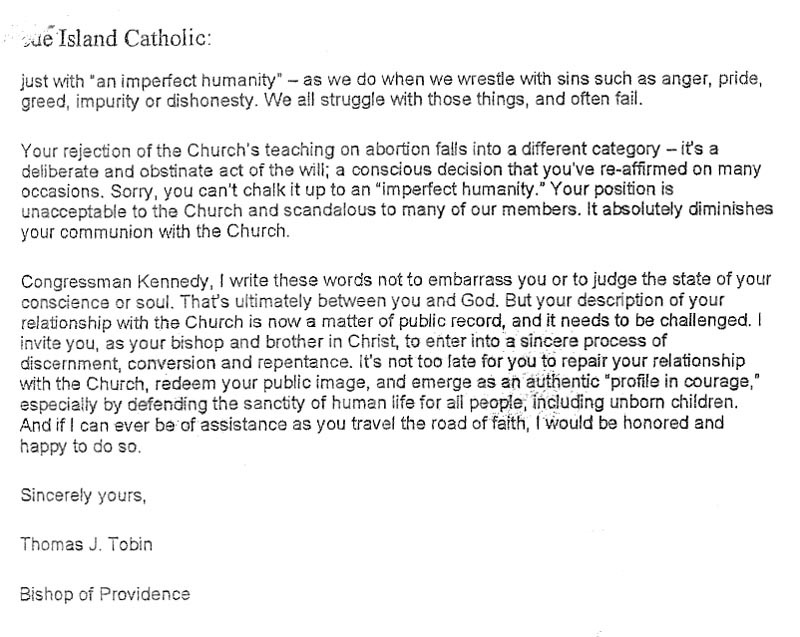 Two years ago in a private letter to Congressman Kennedy Bishop Tobin had admonished him not to present himself for Holy Communion as long as he chose to abuse the power of his office and the prestige of the Kennedy name in order to promote the systematic killing of unborn children. Scripture, after all, states very clearly that "No murderer has eternal life abiding in him" (I John 3:15) and that "He who destroys the temple of God, him will God destroy. For God's temple is holy, and that temple you are" (I Corinthians 3:17). Scripture also condemns the reception of Christ's Body and Blood in the state of mortal sin: "Whoever eats of the bread or drinks of the cup of the Lord unworthily will be guilty of profaning the body and blood of the Lord. Let a man examine himself [that is to say, let him take such steps as are proper to make sure that he is worthy, e.g. through a contrite reception of the Sacrament of Penance] and so let him eat of the bread and drink of the cup. For he who eats and drinks without discerning the body eats and drinks judgment upon himself" (I Corinthians 11: 27-29). (Cf. also the Catechism of the Catholic Church, Section 1457, on the NECESSITY of sacramental confession and absolution for anyone who, having committed a mortal sin, wishes to receive the Eucharist). Bishop Tobin would have been guilty of dereliction of duty had he not instructed the Congressman to abstain from Communion. (One can only wonder whether Boston's Archbishop, Sean Cardinal O'Malley, had similarly instructed Senator Kennedy, the Congressman's father, in a private letter or interview. If so he had, the Senator evidently paid little heed ). Bishop Tobin's admonition would have remained a private admonition, unknown to the public, had it not been for a statement to the press made by Congressman Kennedy as the House of Representatives was about to take up Democrat Bart Stupak's proposed amendment to the Health Care Reform bill, an amendment prohibiting the use of federal tax dollars for the murder of the unborn child. The amendment passed, thanks to the votes of 64 Democrats and the solid support of House Republicans. Indignant at the intervention of America's Catholic bishops with members of the House in support of the Stupak proposal, Mr. Kennedy, with a logic that is a little difficult to follow, charged the bishops with DENYING life-saving healthcare to MANY because of their OBSESSION with abortion: 'You mean to tell me the Catholic Church is going to be denying those people life-saving health care? I thought they were Pro-life....If the church is pro-life, then they ought to be for health-care reform....So this [the bishops' intervention] is an absolute red herring, and I don't think it does anything but to fan the flames of dissent and discord, and I don't think it's productive at all." So incendiary a public statement could scarcely go unanswered. Describing the Congressman's remarks as "irresponsible and ignorant of the facts", Bishop Tobin told the media: "I believe the Congressman owes us an apology for his irresponsible comments. It is my fervent hope and prayer that he will find a way to provide more effective and morally responsible leadership for our state." A scheduled meeting between the Congressman and the Bishop was subsequently called off by Mr. Kennedy, who then told the press: "The fact that I disagree with the hierarchy on SOME issues does not make me any less of a Catholic." [Emphasis added]. 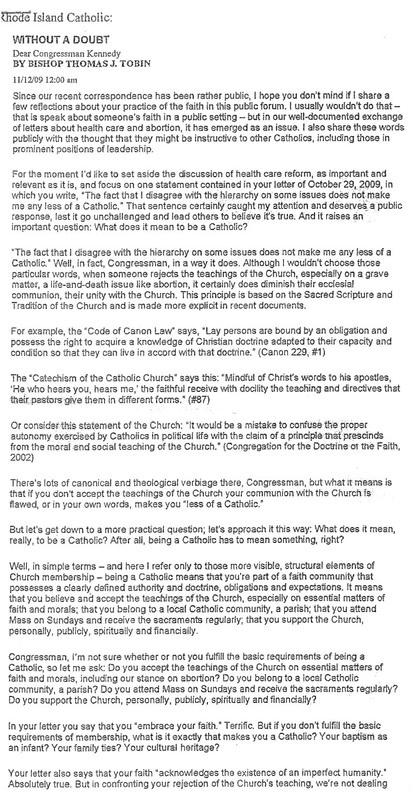 The stage was thus set for a show-down on a matter of fundamental importance: just how far can a self-declared Catholic go in his suppor tfor a course of action that is in flagrant contradiction with the teaching of the Church before said Catholic ceases to have a valid claim upon the name. Indeed, the issue is one that engages all of the other nominally Catholic politicians who, like Patrick Kennedy, continue to support the murder of the unborn. Bishop Tobin proved himself equal to the challenge. Since the Congressman had made the matter public, Bishop Tobin responded with an open letter. For those of you who would like to read Bishop Tobin's letter (published on November 12th) I am enclosing a copy of the text as an insert in our parish bulletin today. Courteous and good-humored in tone, and lucid in its exposition, it is a masterpiece of persuasive argumentation. And in the context of the emerging battle between Church and State over the issue of abortion, it is a document of historic importance.